The California Air Resources Board (CARB) has adopted the most health-protective Ambient Air Quality Standards (CAAQS) for PM10 (respirable particulate matter with an aerodynamic diameter of 10 micrometers or less) in the nation. The PM10 standards in California are 20 µg/m3 (measured as an annual mean) and 50 µg/m3 (measured as a daily concentration). Virtually the entire State is nonattainment for the PM10 standards; this includes Eastern Kern County. Activities associated with Agricultural (AG) Operations have been identified as a significant source of PM10 emissions (fugitive dust) that can contribute to poor air quality in some regions of Eastern Kern. 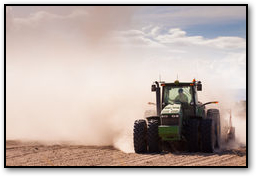 The District recognizes a majority of the fugitive dust generated from AG Operations can easily be mitigated. 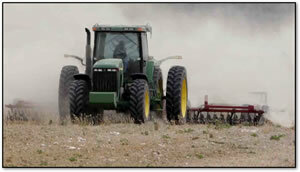 On March 12, 2015, the District’s Board adopted Rule 402.2 (Agricultural Operations), which is designed to prevent, reduce, and mitigate ambient concentrations of anthropogenic fugitive dust emissions generated from agricultural operations through implementation of Conservation Management Practices. An owner/operator of each commercial AG facility (located in Eastern Kern County) with 10 or more acres of contiguous, or adjacent farmland, is required to prepare and submit a Conservation Management Practice (CMP) plan to the District for approval. Conditions of a District approved plan must be implemented no later than ten (10) days after its approval. A separate CMP plan must be submitted and approved for each crop and each site farmed. Confined animal feed operations (CAFOs) are Exempt. A Conservation Management Practice Plan (CMP Plan) is: A document (CMP PlanForm) prepared bythe owner/operator of an AG Operation site that lists theselectedCMPs for implementation. A CMP Plan also contains, but is not limited to, contact information for the owner or operator, a description of the AG Operation and locations of Agricultural Parcels, and other information describing the extent and duration of CMP implementation. 1. Land Preparation and Cultivation. 3. Unpaved Roads and Traffic Areas. A filing fee of $120, paid by check or money order, is required with all CMP plan submittals.